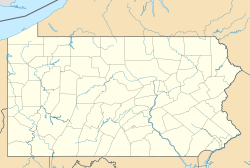 Washington, referred to locally as Little Washington to distinguish it from Washington, D.C., is a city in and the county seat of Washington County, Pennsylvania, United States, within the Greater Pittsburgh Region in the southwestern part of the state. The population was 13,663 at the 2010 census. According to the United States Census Bureau, Washington has a total area of 3.3 square miles (8.5 km2), all land. Delaware Indian chief Tangooqua, commonly known as "Catfish", had a camp on a branch of Chartiers Creek, in what is now part of the city of Washington. The French labeled the area "Wissameking", meaning "catfish place", as early as 1757. The area of Washington was settled by many immigrants from Scotland and the north of Ireland along with settlers from eastern and central parts of colonial Virginia. It was first settled by colonists around 1768. Washington, Pennsylvania, was the center for the 'Whiskey Rebellion' of 1791, which was one of the first open rebellions against the new U.S. government and Constitution. The rebellion was centered on a tax being imposed on whiskey distillation in the region. The house of David Bradford, one of the leaders of the rebellion, is now a museum devoted to the Whiskey Rebellion, the David Bradford House, located on South Main Street of the city. 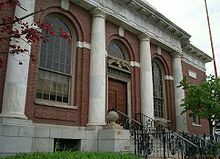 The town was incorporated as a borough on February 13, 1810, and became a city of the third class in 1924. In August 1875, construction began of the 3 ft (914 mm) Waynesburg and Washington Railroad, conceived by John Day in 1874 and chartered in 1875. Passenger services ended in 1929, conversion to standard gauge followed in 1944, when it was renamed the Waynesburg Secondary. Freight services ended in 1976, although part of the line still survives for access to a coal mine. James B. Wilson chartered the Washington Electric Street Railways in 1889 with construction beginning in November 1890. The first line was built from the Waynesburg and Washington Narrow Gauge station to Wilson Orchard, just north of the present day site of the Washington Hospital. In 1903 the Washington and Canonsburg Railway Company linked the two towns with a trolley line. The company was bought by the Philadelphia Company in 1906, later becoming part of the Pittsburgh Railway Company, linking through to Pittsburgh as part of their interurban service in 1909. The line closed on August 29, 1953. A short section of the line and a number of trolley cars are preserved at the Pennsylvania Trolley Museum north of the city. As of the census of 2010, there were 13,663 people residing in the city. The population density was 4,140.3 people per square mile. The racial makeup of the city was (10,373) 75.92% White, (2,803) 20.52% African American,(131) 0.96% Asian, and (107) 0.78% from other races. Hispanic or Latino of any race were (249) 1.82% of the population. As of the census of 2000, there were 15,268 people, 6,259 households, and 3,486 families residing in the city. The population density was 5,199.2 people per square mile (2,005.1/km²). There were 7,111 housing units at an average density of 2,421.5 per square mile (933.9/km²). The racial makeup of the city was 81.88% White, 14.60% African American, 0.15% Native American, 0.45% Asian, 0.02% Pacific Islander, 0.61% from other races, and 2.29% from two or more races. Hispanic or Latino of any race were 0.94% of the population. Also in the city are two historic homes, that of David Bradford on Main St. and that of F. Julius LeMoyne on Maiden Street. Bradford's home was later the birthplace of American realist author Rebecca Harding Davis in 1831. LeMoyne was an ardent abolitionist whose home was part of the Underground Railroad; LeMoyne was a doctor who also built the first crematory in America. The David Bradford House and F. Julius LeMoyne House are listed on the National Register of Historic Places, along with the Administration Building, Washington and Jefferson College, Dr. Joseph Maurer House, Pennsylvania Railroad Freight Station, Washington Armory, Washington County Courthouse, and Washington County Jail. On January 27, 2006, to commemorate the Pittsburgh Steelers' appearance in Super Bowl XL, the city council voted to symbolically rename the city "Steelers, Pennsylvania" through February 5, 2006. Washington Symphony Orchestra, founded 2002, offers four to five concerts annually. The Washington Community Theatre presents several musicals and other productions throughout the year, with a feature production held each June in the Main Pavilion at Washington Park. WCT celebrated its 40th anniversary in 2009. This page was last edited on 24 March 2019, at 18:29 (UTC).